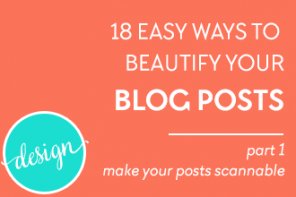 I’m finally launching a Beautify Your Blog Design Guide! 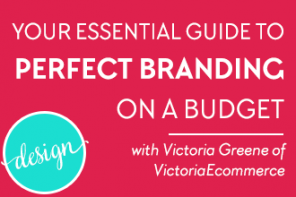 I want the guide to answer all your heart’s desires about blog design. I want it to guide you step-by-step until you FINALLY have the blog of your dreams! Please tell me what you want to learn about blog design and what your biggest struggles are. Your answers will be confidential and will earn you a spot on the Insider’s list to hear more about the guide before everyone else + you’ll get a sample chapter and a discounted price at launch. Thanks so much. Watch for the official launch this fall! Hi Kate, I am not familiar with the counter pin it button. How did you activate it? Is her blog a Blogger blog too or is it a WordPress plugin? I’m not sure how doing something on her site would affect yours though, that sounds very strange. width: 250px; <---------------- } Are you able to upload a larger image? Hi Marianne.I enjoy your blog so much! Thank you for taking time for our questions too! Overall I think the design is nice, there are 3 things though that stand out to me in particular: the header is much too tall. On small screens, it’s all you see and you don’t see any of the content at first glance. Try making it shorter. Perhaps move the logo to the left and smaller and align the images to the right of it. Also the black text is a little harsh. Try #555555 instead. It’s a dark gray but a little more soothing to the eyes and would go better with your soft background. Black is quite popular in blog design right now, but in more minimal designs and with thinner fonts (see http://www.blogmilkshop.com/ for examples). The last thing I would say is that the top of your sidebar should have a good photo of you (this is really important!) with a small description that tells newcomers why they should stay and read your blog. Tell them what you offer there and what’s different about your blog and how it would benefit them. Thanks for stopping by my blog Marianne! I really do appreciate your honest feedback. I’ll make those changes you mentioned as soon as I get the chance. Have yourself a great day! Vickie McCarty recently posted…Public School: Should we get our Kids out? Sure thing! Looking better already! Thank you Marianne! With Blogger you are very limited. Lol! I tried downloading a different template but it was a crazy mess! On a different note: I read somewhere that if any of my posts would happen to ever go viral, that my site could possibly crash. Its something to do with Blogger…? Do you have any advice about that? I think that could be possible but I don’t know how sure that is. I unfortunately don’t know anything about it though. I wouldn’t worry about it for now. If you get to the point where your blog gets pretty big, you’ll probably want to move to a self-hosted WordPress site by then. Hi Cristina, thanks so much! I really do appreciate that coming from a talented designer like yourself! An ultimate guide on how to make your WordPress blog feminine and pretty. I’ve been trying to make my wedding blog look pretty and unique and it as been a challenge. And also how to add gold metallics to your blog. I see alot of girly blogs with gold shimmer. I would love to know how to incorporate it into parts of my blog. Thanks for your suggestions Mel! I am working on a guide right now and plan to have it finished this fall. I hope it’s what you’re looking for! And ooh good suggestion on the gold! I’ve been meaning to write a post about the gold trend so now I’ll try and get on that sooner than later! Do you do blog designs? I want to change my websites feel and the way it looks, and the person I currently have is not helping me at all. please let me know, I’m desperate! If neither of them work, I do know a few others I can send over. Just let me know! 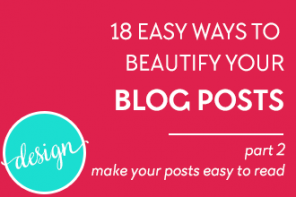 I love the design tips on your blog and have lost count as to how many I’ve implemented! One question how you add text above your default naked ConvertKit forms (below posts) – I’ve only been able to use a naked form with name and email but no text, or a simple inline form with text but no name field! How do you combine name, email address and text above form? Hi Nisha, I modify the HTML that you cut and paste from ConvertKit. Are you able to do that or are you using the plugin to add your forms? 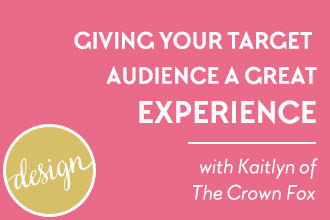 Designing your brand isn’t just about visual design, it’s about creating a great experience for your readers!